(Nanowerk News) In recent years, a complicated discussion over which direction solar cells should face — south or west — has likely left customers uncertain about the best way to orient their panels. Now researchers are attempting to resolve this issue by developing solar cells that can harvest light from almost any angle, and the panels self-clean to boot. 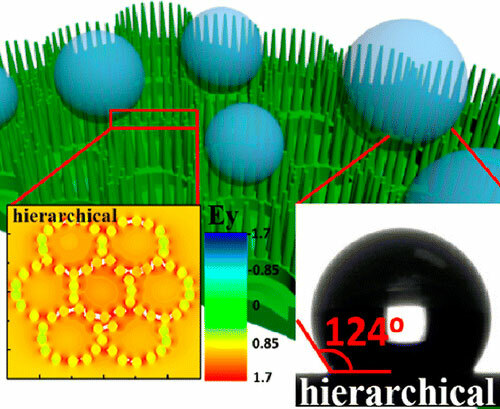 Their report appears in the journal ACS Nano ("Packaging Glass with a Hierarchically Nanostructured Surface: A Universal Method to Achieve Self-Cleaning Omnidirectional Solar Cells"). Commercial solar panels work best when sunlight hits them at a certain angle. Initially, experts had suggested that solar panels face south to collect the most energy from the sun. But an influential 2013 report by Pecan Street, an energy-research organization, advised that systems tilt westward to maximize efficiency. Further analysis has found that determining the ideal angle is more complicated — in essence, it depends on where you live. And even if customers get the positioning correct, they’re still losing out on prime sunlight because most residential systems can’t move or adjust to the sun’s track across the sky. Jr-Hau He, Kun-Yu Lai and colleagues wanted to address this shortcoming. The researchers developed a glass coating that incorporates ultrathin nanorods and honeycomb nanowalls that can help underlying solar cells harvest sunlight from multiple angles. The cell efficiency can be boosted by 5.2 to 27.7 percent, depending on the angle of the light, and the efficiency enhancement can be up to 46 percent during long-term use. The material also repelled dust and pollution that would otherwise block some rays from getting absorbed and converted to electricity. The new glass coating kept panels working outdoors at optimum levels for six weeks while the efficiency of panels with an unmodified coating dropped over the same period.